Dunnedin Ventures Inc. (TSXV:DVI) (the “Company” or “Dunnedin”) today announced it has entered into a purchase agreement to acquire 100% ownership of the consolidated Man, Prime and Dillard properties, the “MPD Project”, in south-central British Columbia. Dunnedin Ventures Inc. (TSXV:DVI) (the “Company” or “Dunnedin”) today announced it has entered into a purchase agreement to acquire 100% ownership of the consolidated Man, Prime and Dillard properties, the “MPD Project”, in south-central British Columbia. The MPD Project is an excellent strategic fit with Dunnedin’s 100% owned Trapper copper-gold porphyry project (“Trapper”, see news release November 27, 2018), located in the northern Golden Triangle area of British Columbia and joins this project to form a strong copper-gold porphyry portfolio that has the potential to stand alone from Dunnedin’s Kahuna Diamond Project in the future. 129 drill holes (25,780 metres) were completed from 1966 to 2014. Previous operators include Rio Tinto PLC and Newmont Mining Corp.
Dunnedin Ventures Inc. (TSXV: DVI) is focused on its 100% owned, advanced-stage Kahuna Diamond Project in Nunavut which hosts a high-grade, near surface inferred diamond resource and numerous kimberlite pipe targets. The Company holds diamond interests in 1,664 km2 of mineral tenure located 26 kilometres northeast of Rankin Inlet and adjacent to Agnico Eagle’s Meliadine gold mine. The Kahuna Diamond Project has an Inferred Resource Estimate of 3,987,000 tonnes at an average grade of 1.01 carats per tonne, totalling over 4 million carats of diamonds (+0.85 mm) (see news release dated March 31, 2015). 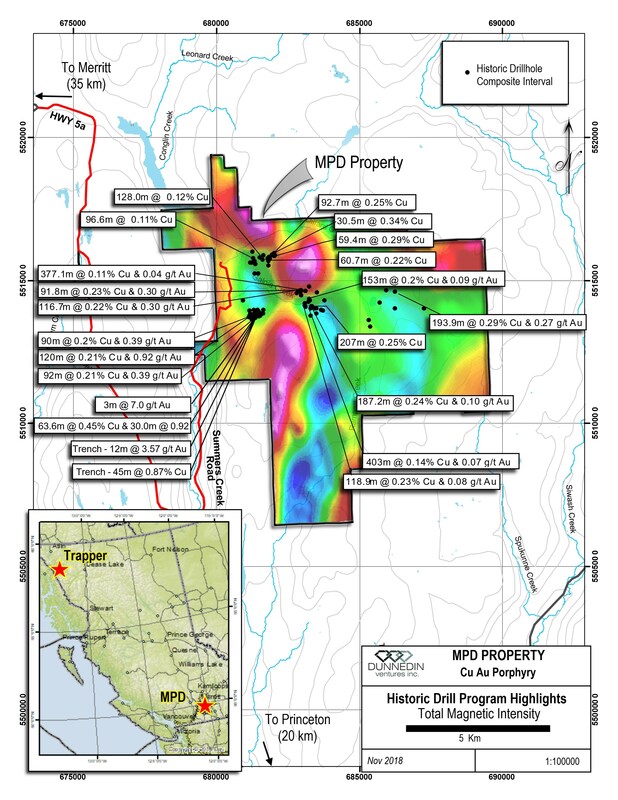 Dunnedin’s drilling is aimed at the discovery of diamondiferous kimberlite pipes, and the Company is working with advisor and largest shareholder Dr. Chuck Fipke to define and prioritize drill targets based on an extensive historic data set, and diamonds and indicator minerals recovered from a series of kimberlite and till samples over four seasons of field work. Dunnedin also holds a 100% interest in the Trapper Project near Atlin in the northern “Golden Triangle” region of British Columbia. The Trapper Project is interpreted to overlie a gold-rich copper porphyry complex having a surface geochemical, geophysical and regional alteration signature of over 15 square kilometres. Based in Vancouver, Dunnedin is backed by a world-renowned team of exploration experts with decades of combined exploration experience and significant capital market strength.